We have always put a great effort in product innovation and do we have a very close co-operation with our clients in the process of product development. Our comprehensive range off fishing gear includes pelagic trawls, semi pelagic trawls, bottom trawls, shrimp trawls, purse seine nets, pots, sorting grids, trawl doors, trawl cameras etc. For the aquaculture industry we manufacture cage nets, cages, mooring equipment, bird nets, seines, drum net washers etc. 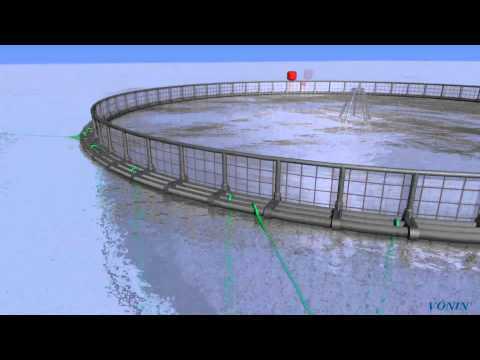 www.vonin.com - Vónin's aquaculture equipment is designed to withstand the harsh weather and currents of the North Atlantic. Expensive doors can turn out to be the cheapest doors, according to Vónin’s Søren Havmand. He explained that the company’s Storm demersal doors were designed without even thinking about the cost, as the design team set out their criteria. Greenlandic trawler Markus took delivery of its 1680 pelagic trawl from Vónin last year, ahead of the mackerel fishery, and finished the season as the top catcher, and since then Vónin has supplied the same trawl type to Russian company Dobroflot for fishing mackerel and herring. Vónin’s Flyer lift device has been through a long development process, but the results are positive, according to Óli Horn at the company’s demersal fishing gear division. One of the challenges was to find the right material that was strong but without being too rigid, and now that this is available, Flyers have been in regular use since the beginning of this year. Vónin was involved early in the aquaculture business, drawing on its long background in many types of fishing gears, as fish farming grew rapidly in the Faroese fjords, and it wasn’t long before Vónin’s expertise was in demand across the rest of the Nordic region and in the UK. Ålesund trawler Atlantic Viking has seen some notable successes with its Bacalao trawls from Vóninand. Faroese fishing gear company Vónin has a presence on the international market that continues to grow across the north Atlantic region. Vónin has branched out to design and develop its own range of trawl doors, in cooperation with a leading specialist in fluid and aerodynamics. During the aquaculture trade show Aqua Sur, to be held in Puerto Montt, Chile from 10-13 October, Faroese equipment suppliers Vónin, KJ Hydraulik and JT Electric have teamed up for a joint promotional effort. Fishing gear company Vónin has taken over three-quarters of Strandby Net, in a deal expected to expand and consolidate the company’s international position. In June this year, Vónin delivered a new 2,048m pelagic trawl to M/V Jupiter FD42, for mackerel surface pair trawling. Faroese fishing gear manufacturer Vónin has hired Sigvald Lydersen Jacobsen as international sales representative for its aquaculture department, focusing on robust net cages, heavy-duty mooring systems, and ‘virtually maintenance-free’ floating frames. Late last year Vónin supplied monkfish trawls to an undisclosed foreign fishing company. Vónin has received very good feedback on two codends that were made for Danish purse seiner/trawler Ruth HG264 last summer. Together with the Marine Institute in Newfoundland, Vónin and Vónin Canada are working together on a project with a goal to reduce the impact that bottom trawls have on the seabed. One of the largest and most modern shrimp trawlers in Canadian waters is the "Mersey Phoenix" owned by Mersey Seafoods Ltd.
With design, development and production facilities and repair workshops in the Faroe Islands, Greenland and Newfoundland, Vónin® offers products and services for trawlers and purse seiners of every type, as well as for the fish farming industry. Vónin’s new sorting system for pelagic fishery is designed to improve profitability and consists of a four-sided net tunnel with a flexible grid fitted inside. This sorts larger fishes from, for example, blue whiting and herring. The larger fish that do not pass through the grid, escape through an opening in the bottom. The growing trend for hull building in Poland continues with two new pairtrawlers for Faroes home port Leirvik which have been fitted out by Faroes company Vónin Ltd., based in Fuglafjørdur . 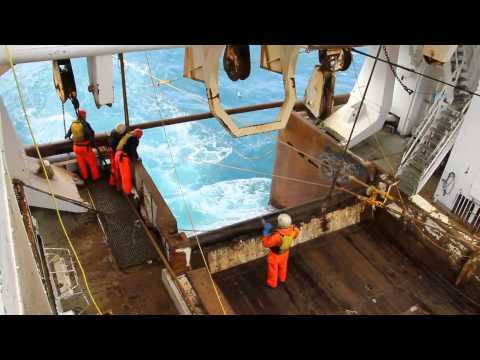 The 120 metre long Dutch factory trawler Frank Bonifaas SCH 72 took onboard a new Herring -- Bluewhiting trawl this summer, after mounting a new crane on deck.